The president's order places a 90-day travel restriction on immigrants from Iraq, Iran, Sudan, Libya, Somalia, Syria and Yemen attempting to gain entry into the country; it also indefinitely bans Syrian refugees from entering the U.S.
President Trump denied Sunday that his order was a "Muslim ban" and pledged "to show compassion to those fleeing oppression"
Protests against President Trump's immigration ban continued into Monday, as thousands of people across New York and New Jersey demonstrated for a third straight day. CUNY students rallied for Saira Rafiee, the grad student barred from returning to the U.S. from Iran, and Columbia University held a demonstration of its own on campus. Later in the evening on the Lower East Side, neighbors and officials gathered at Tompkins Square Park to protest. At Rutgers Presbyterian Church on the Upper West Side, members lit candles for a family of Syrian refugees who were scheduled to arrive Monday as guests of the church but are now among those banned indefinitely under Trump's executive order. And across the river, more than 1,000 people rallied in Jersey City, packing the Grove Street Plaza. Among them was Shahida Shahid, a Muslim immigrant from Pakistan, who said she took comfort in the large gathering -- a sign that she's not alone. Thousands of people marched in lower Manhattan on Sunday to protest President Trump's executive order that temporarily bans people from seven countries. Wale Aliyu reports. "We are not afraid," she said. 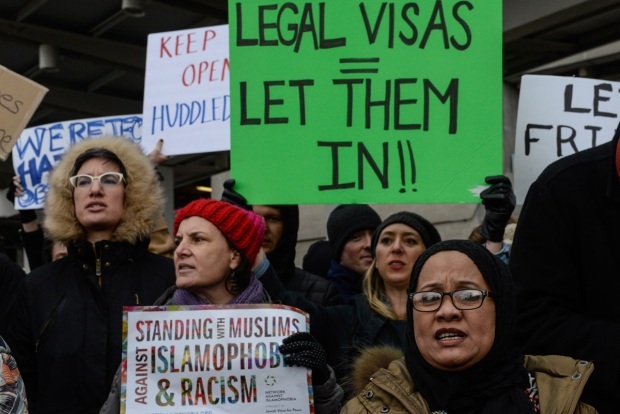 Trump's controversial order, which has ignited protests across New York and the nation, places a 90-day travel ban on immigrants from Iraq, Iran, Sudan, Libya, Somalia, Syria and Yemen. 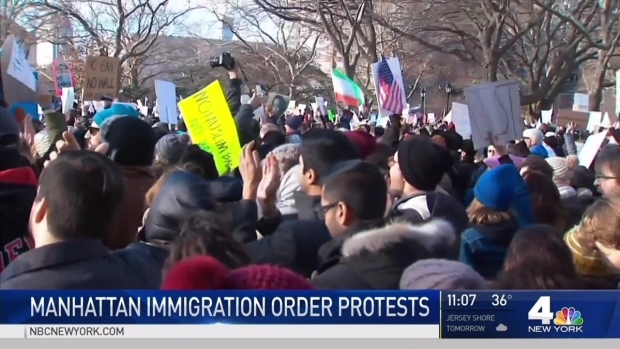 It also indefinitely bans Syrian refugees from entering the U.S.
New Jersey Democrats joined their New York brethren in blasting Trump's "appalling" refugee ban as Sen. Chuck Schumer vowed to try to bring a vote to repeal the order to the Senate floor. Sen. Bob Menendez, who serves on the National Security Committee, called Trump's order imposing a 90-day travel restrictions on immigrants from several Muslim-majority countries "un-American and not in the interest of our national security." Menendez said the executive order undermines the "very essence of what America is all about." Congressman Bill Pascrell, who represents New Jersey's ninth district, piggy backed on Menendez's sentiments, calling the order "distraction and excuses." "Shame on them," Pascrell said. Speaking on "Today" Monday morning, Schumer said, "This is a blanket ban. It hurts innocent people and doesn’t stop terrorism. It’s just appalling." About an hour before the Democrat's appearance on "Today," Trump tweeted that only 109 of 325,000 people "were detained and held for questioning" following his executive order. He said "big problems" were created at airports by a Delta Airlines computer outage, "protesters and the tears of Senator Schumer." The president also tweeted, "there is nothing nice about searching for terrorists before they can enter our country." Sunday's rally followed a night of demonstrations at John F. Kennedy Airport, where thousands of people spontaneously gathered to demand the release of detained travelers. 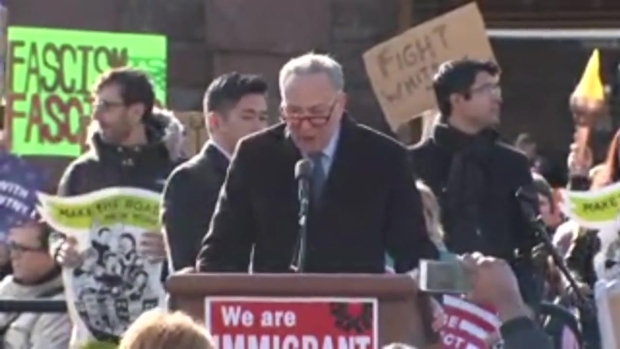 Sen. Charles Schumer denounced President Donald Trump's executive orders, calling them "bad for national security" and decrying them as anti-American during an immigrant march at Battery Park Sunday.